While the South African film market is maturing, the lack of market research is "one of the biggest problems" facing the local industry, says producer Danie Bester of Film Factory. A record 24 local films were released in 2010 with "Schuks Tshabalala's Survival Guide to 2010," setting a new box office record for a South African film, raking in R37.5 million ($5.4 million). A comedy revolving around the 2010 World Cup soccer tourney, directed by Gray Hofmeyr and starring and co-written by Leon Schuster, the country's most bankable star, there was little doubt the film would do well. Even so, "the economic reality of our industry makes it difficult to justify the cost associated with research," says Bester, who produced 2008 hit "Bakgat!," the first ever Afrikaans teen comedy. At present, many in the local industry rely on sporadic research by the National Film and Video Foundation, the Dept. of Trade and Industry and the local film commissions. "Hopefully, the NFVF will push up the amount and quality of research," says Bester. "There are not enough resources available in South Africa. A lot of the projects developed are chosen for every reason but strong market analysis." Ross Garland exec produced helmer Donovan Marsh's local hit "Spud," based on John van de Ruit's novel of the same name about 14-year-old Spud's first year at boarding school. It was one of 24 homegrown films released last year. 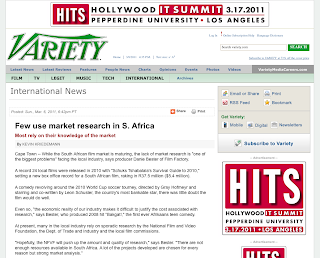 He says, "Market research companies haven't played much of a role in the industry to date, although that might change as we now see the industry maturing into a tangibly commercial space here for local content producers." Most producers do conduct their own forms of ad hoc research, according to Garland. "Producers decide on the film they want to make first. Market research, or at least researching comparable film performance, helps right-size the budget and develop a sensible business plan. To do this a producer needs to be honest about the project and where it fits in terms of its genre and natural audience pull." "Spud" was published in 2005 giving Garland five years of anecdotal feedback from fans, which helped to assess its crossover potential.